Choptank River Lighthouse (Replica)* – Chesapeake Chapter U.S.L.H.S. 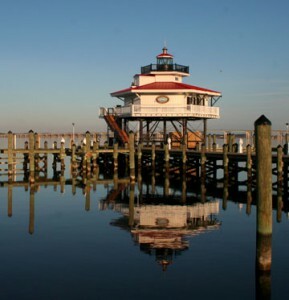 The City of Cambridge, Maryland, approved plans to build an exact replica of the lost Choptank River Lighthouse. After many years, the Maryland Legislature passed and Governor O’Malley signed legislation allowing this over water structure. The replica was completed in the fall of 2012. For more information: www.choptankriverlighthouse.org. 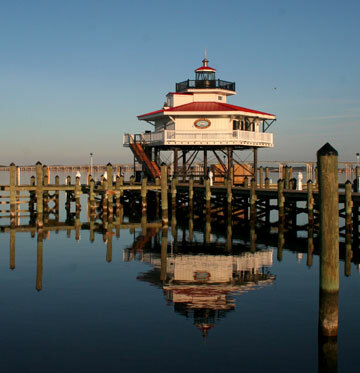 The Choptank River Lighthouse Replica is located on the waterfront in Cambridge Maryland at the end of Pier A at Long Wharf Park. The lighthouse is open daily for self-guided tours of the lighthouse and the small museum it houses.